GRAY SUMMIT, Mo., March 16, 2017 /PRNewswire/ -- The first official day of spring and warmer weather is upon us. Nestlé Purina invites the whole family to plan a visit to Purina Farms for a fun and interactive experience getting up close and personal with our favorite animal companions when the Visitor Center officially re-opens for the 2017 season on Saturday, March 18. 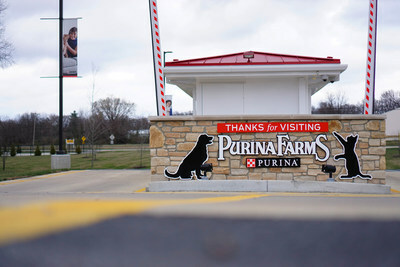 Located in Gray Summit, Missouri, approximately 40 miles west of downtown St. Louis, Purina Farms is designed specifically for pet lovers of all ages and brings pets and people closer together for life-enriching experiences. "At Purina, we are passionate about making a big difference in the lives of pets and people," says Kaite Flamm, Manager, Purina Farms. 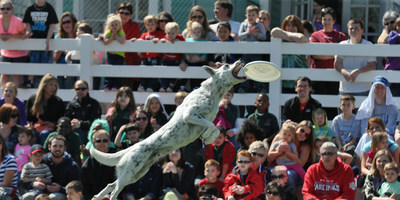 "Purina Farms brings this dedication to life. We want guests to get active with pets, whether it's being more involved with their own pets at home, participating in competitive events with their dogs and cats, or advocating for homeless dogs and cats." New for the 2017 season is a fresh paint job at the Visitor Center to incorporate Purina's iconic Checkerboard red, along with a new main entrance. Interactive Better with Pets exhibit, where pet lovers of all ages can celebrate the powerful relationship people and pets share and learn about responsible pet care. Guests can help trigger a donation to the Petfinder Foundation in support of homeless pets* simply by turning in the pet I.D. card they receive at the beginning of the experience. The Petfinder Foundation provides grants to shelters and rescue groups around the U.S. to help them in their life-saving work to place homeless pets in loving homes. Learn more about all the exhibit has to offer here. Barn and play area, which houses domestic farm animals and also features rope swings, tunnels and pedal tractors. There's also a theatre, a concession area, gift shop, and information center. In addition to daily activities at the Visitor Center, Purina Farms hosts events year-round, including the popular Springtime Village March 29-April 15. Purina Farms also hosts some of the most prestigious dog and cat shows in the country at the Purina Event Center, including national all-breed dog shows like the Dalmatian Club of America, Poodle Club of America and the German Shepherd Dog Club of America. View a full calendar of events here. Purina Farms is located at 200 Checkerboard Loop in Gray Summit, Missouri, just off Highway 44. The Visitor Center is open seasonally, while the Purina Event Center is open year-round. Reservations are strongly encouraged in order to stagger the arrival times of guests for the best experience. Call 314-982-3232 between 9:30 a.m. and 3:30 p.m. Monday through Friday to make a reservation. Click here to learn more and plan your visit. *Beginning on March 18, 2017 and ending on November 12, 2017, Nestlé Purina PetCare Company will donate $0.01, for each pet I.D. card turned in at the Better with Pets Exhibit at Purina Farms, to Petfinder Foundation with a minimum $2,000 donation up to a maximum of $5,000. For more information about the Petfinder Foundation, please visit www.petfinderfoundation.com. Purina Farms is a family friendly attraction that offers pet lovers of all ages an opportunity to get up close and personal with barnyard animals and amazing dogs and cats. 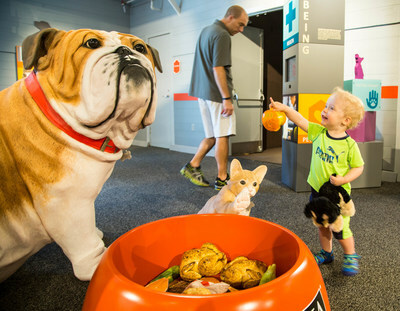 The Visitor Center offers a variety of fun activities, including hayloft play areas, interactive educational exhibits, tractor-drawn wagon rides and exciting canine performances. Purina Farms is a must-visit destination for family outings, school field trips, community group events and individual pet lovers of all ages. More than 190,000 pet lovers visited Purina Farms in 2016. Just up the hill from the Visitor Center is the Purina Event Center, a state-of-the-art 84,000 sq ft indoor facility that is open year-round to host some of the most prestigious dog and cat shows in the country as well as special dog-friendly events open to all dogs and their owners. Visit purinafarms.com to learn more.